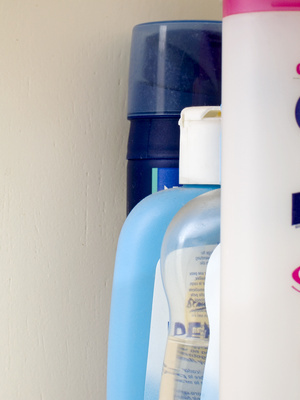 Cocamidopropyl betaine is a chemical found in many personal care products, including shampoo, toothpaste and body wash. The chemical is derived from coconuts and is used to make products produce more foam. Because cocamidopropyl betaine originates from coconut oil, even some personal care products labeled as natural still contain it. Although the government regards the ingredient as safe, some people do have negative reactions after exposure to it. Cocamidopropyl betaine can cause allergic reactions in some people, according to Tom's of Maine. Some of the reactions the chemical can cause include irritated skin and rashes. Products containing cocamidopropyl betaine can also cause serious skin reactions, including burning and itching. According to the online natural living magazine Pure-Zing.com, cocamidopropyl betaine is even linked to blistering skin, especially in products with a lot of impurities. As an ingredient in shampoos for both adults and children, cocamidopropyl betaine can easily get into the eyes. This may cause significant eye irritation, according to the HERA Project, which assesses the risks of ingredients in common household products.